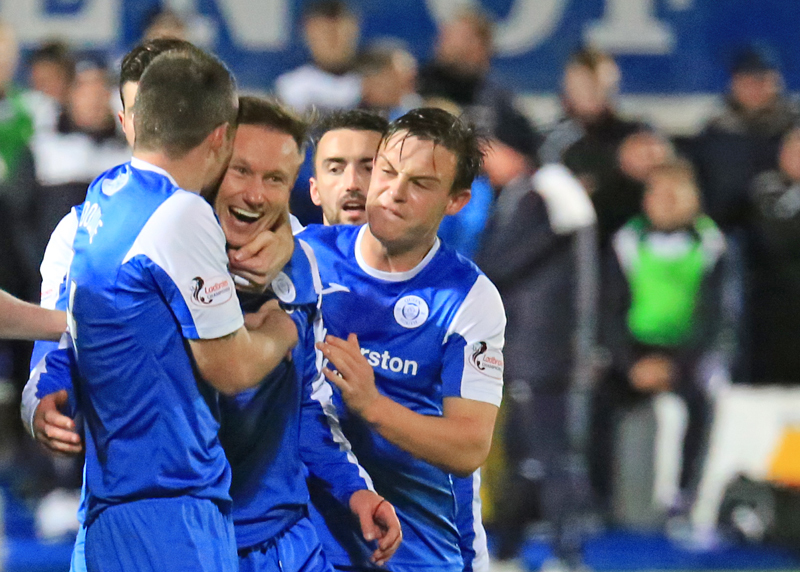 Queens came from behind twice to claim a hard fought point in today`s Championship clash with Falkirk as the sides shared four goals in what turned out to be a very entertaining game. It didn`t seem as though Queens would be able to cope with a rampant Falkirk side that completely dominated the first quarter of the game, but a change in formation, and a spirited performance from that point onwards saw Queens more than match their higher placed visitors, and in the end they thoroughly deserved to take a share of the spoils. Following last weekends defeat at Morton, Queens made 4 changes to the team that began at Cappielow. There were starting places for Iain Russell, Alex Harris,and Kyle Jacobs,whilst Andy Dowie returned to the side after a 5 game absence. Visitors Falkirk included 3 former Queens players in their line-up, as John Baird, Mark Kerr, and Bob McHugh all faced their former team. There was a minutes silence held before kick-off to show respect for all those who were tragically killed in the recent Paris attacks, and a section of the visiting support held a French flag aloft as the silence was well observed. The game began with Queens lining up in a 4-5-1 formation, and unusually attacking the Portland Drive end in the first half, although for the opening 25 minutes they were hardly able to get out of their own half such was Falkirk`s dominance in the opening period of the game. After winning their first corner after just 2 minutes, the visitors practically laid siege to the Queens goal as they piled on the pressure looking for the early breakthrough. Muirhead, and then Grant both went close with headers, before Andy Dowie`s short header back to Robbie Thompson almost proved costly, and when the ball was recycled the visitors won a free-kick just 5- yards outside the penalty box. 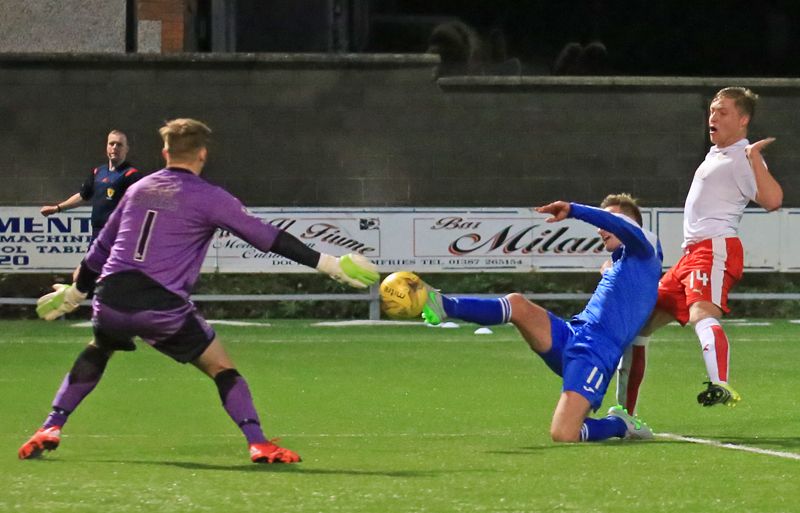 Sibbald`s goal bound effort was deflected for another corner and from the resulting set piece, Robbie Thomson pulled off a splendid one-handed save to keep out a powerful close range header from McHugh. As the away side continued to push forward, Muirhead and Alston exchanged passes before Muirhead side-footed an effort over the bar from just inside the box. The opening stages had been a struggle for Queens, but in a rare foray forward, Alex Harris tried his luck from the edge of the area only to see his low shot slip past the post. That was as it good as it got for the home side in the opening 15 minutes, the returning Andy Dowie was booked for a foul on Baird,and after their very promising start, it was the visitors who deservedly made the breakthrough on 17 minutes. The Queens defence had been under constant pressure especially at set-plays, and it was no surprise that the opening goal came from a corner as Vaulks was on hand to send a header past Thomson from close range. At that stage of the game the goal was certainly well merited as the visitors had been on the front foot from the opening minute, but credit to James Fowler who realised that the formation was not working, and by reacting quickly to change the formation, Queens at last began to work their way into the game. Alex Harris moved to play just behind the strikers, and almost instantly got his side level, but his decent effort was pushed over the bar for a corner by `keeper Rogers. 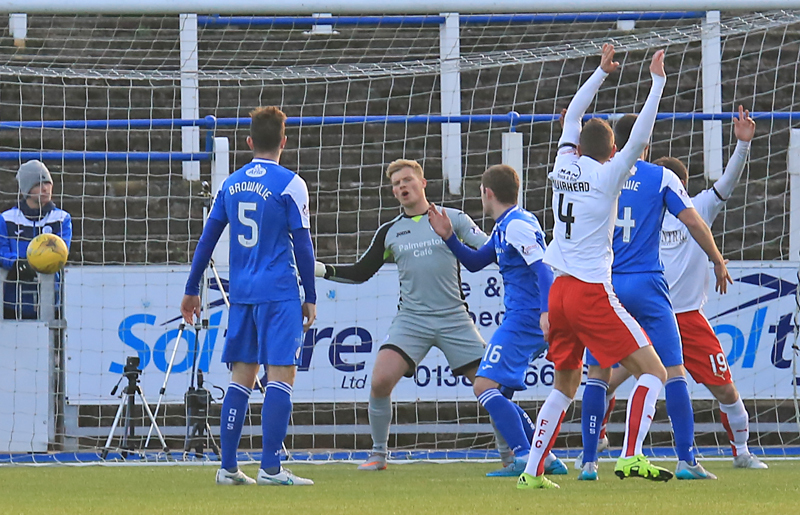 Millar`s deep corner was met at the back post by Darren Brownlie, but he was unable to keep his header on target. This was by far Queens` best moments of the half and they came close once again to levelling the game on 33 minutes. Mark Millar jinked his way past two defenders to get to the bye-line and picked out Kyle Jacobs at the far post, and although his shot was on target, the `keeper made a comfortable save. 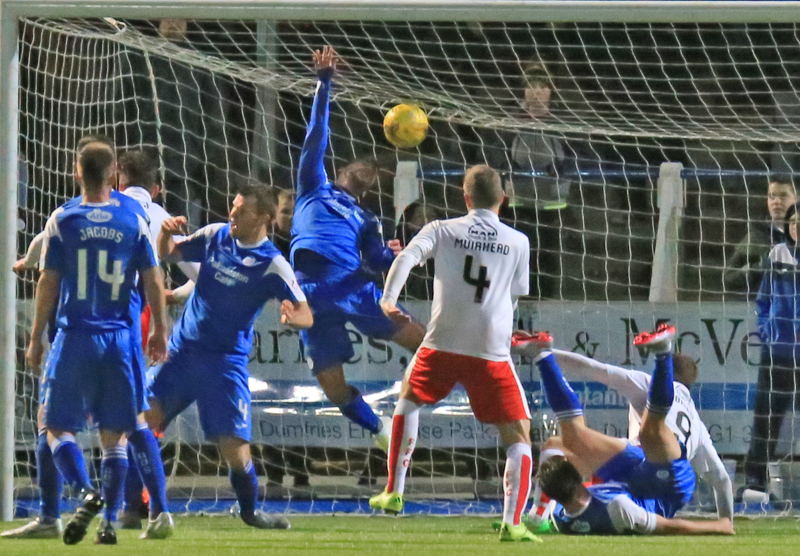 The change in the way the game was progressing turned full circle after 35 minutes when Queens drew level via the penalty spot. 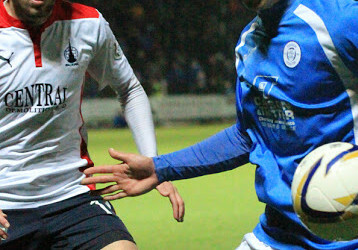 Derek Lyle was bundled to the ground in the box by Falkirk skipper, McCracken, and referee McLean had no hesitancy in pointing straight to the spot. 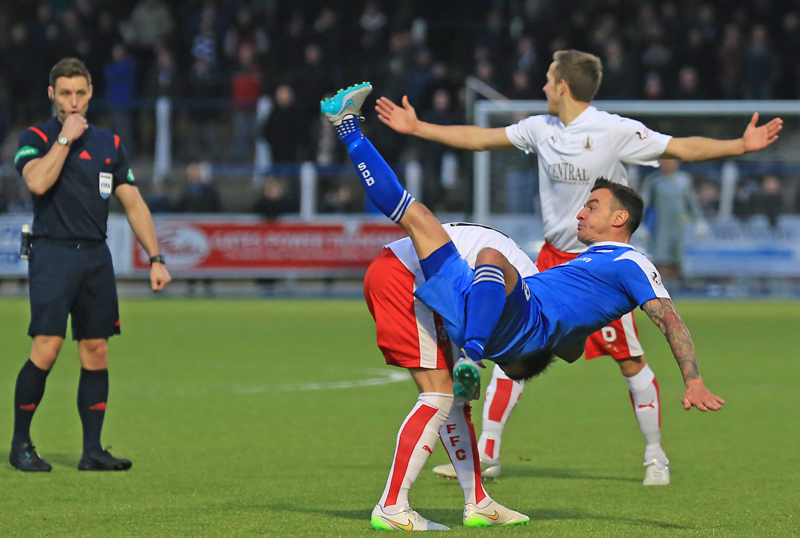 Derek Lyle picked himself up to send the `keeper the wrong way with his perfectly placed shot. 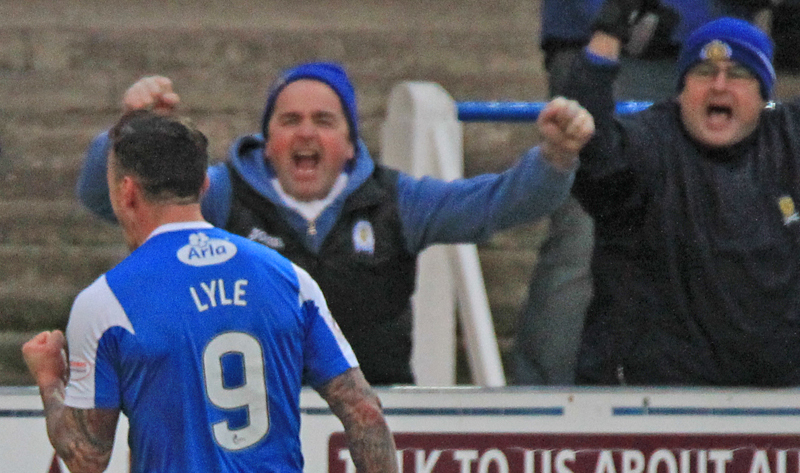 The goal was Lyle`s 9th so far this season, and his 87th in total in a Queens shirt, and was just reward for the way that the home side had worked their way back into the game. The visitors seemed a little disjointed at this stage but they reacted well to losing the goal, and 3 minutes before the break Leahy went close with a free-kick awarded for a foul by Jordan Marshall. Falkirk ended the half as they had begun it by forcing 3 corners in succession, the last of which saw Robbie Thomson hold on well under pressure to take the ball above several opposing players. That was the last action of the half, a half that started poorly for the hosts but following the change of formation and the manner in which the players stuck to their tasks, Queens were certainly worthy of being level at the break. It might have been the away side who started better in the first half, but it was certainly Queens who began the brighter after the break. 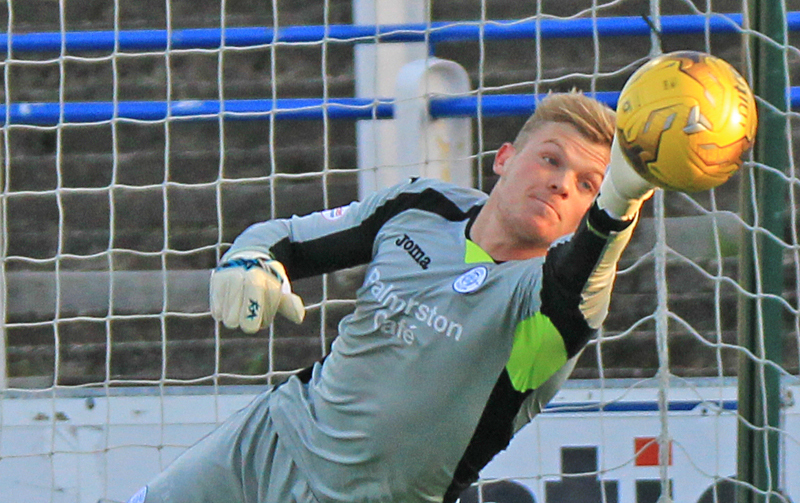 Alex Harris was not so far away from giving Queens the lead for the first time in the game when his low drive across goal from the left was pushed behind for a corner, and then Darren Brownlie had an effort blocked away for a corner during the next attack as the home side controlled the early stages of the half. Harris almost got on the end of a through ball from Kyle Hutton, but he was just given offside - a close call, but the correct one. following a late challenge on Muirhead. Both teams then made substitutions with Ryan Conroy replacing Harris, and Sinnamon replacing McCracken for Falkirk for the final ten minutes of the contest. After being on the back foot for most of the second period, the visitors seemed to pick their game up again and it took an absolutely outstanding save by Robbie Thomson to push Baird`s shot onto and over the bar to keep the score level. However within seconds from making that stunning save, Thomson was picking the ball out of the net as once again a corner kick was the undoing of Queens. The set-piece delivery was headed against the bar and as it bounced down, substitute Lee Miller was quickest to react, heading the ball home from close range to spark wild celebrations amongst both Falkirk players and the travelling support. 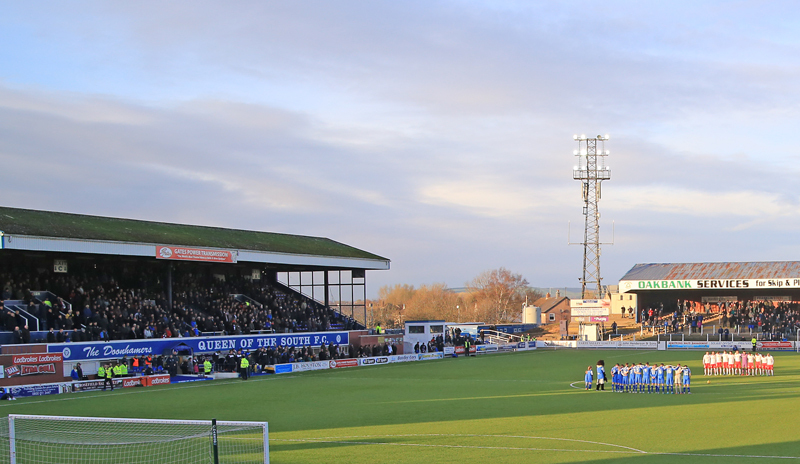 With only 7 minutes left of the game it appeared that Queens were going to suffer yet another home defeat, but with the cheering from the Falkirk fans still ringing around Palmerston, the home side drew level. When the break of the ball fell into the path of Iain Russell just inside the penalty area, he showed great composure to keep control under pressure before prodding the ball past the advancing Rogers to tie the game up. 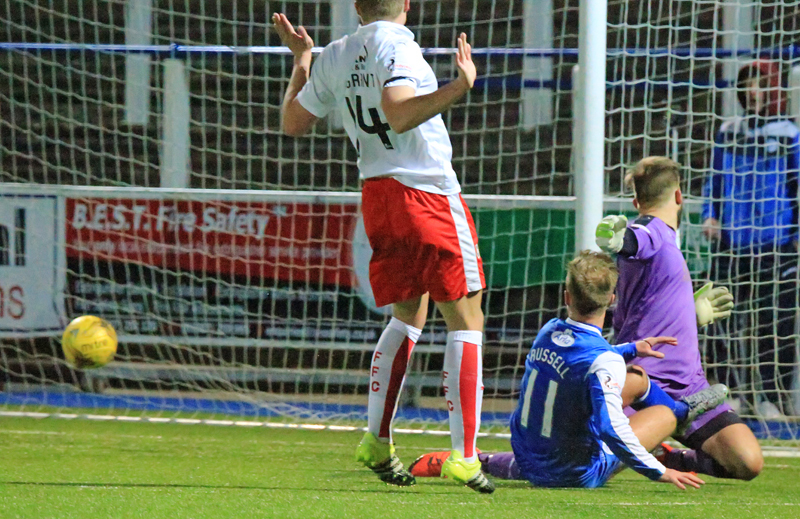 The goal was only Russell`s 4th of the season but it was a well taken goal and the perfect reply to the somewhat over the top reaction by some of the Falkirk players celebrating their second goal. Gary Oliver replaced Derek Lyle for the final few minutes, and there was even time for Queens to possibly grab all three points when Conroy found himself in space in the box, but instead of shooting, he tried to find a pass but had no-one supporting him. Mark Millar nearly went close to writing the perfect headlines but his thunderous drive smashed into Leahy, pole-axing the unfortunate Falkirk defender. Jake Pickard replaced Iain Russell deep into stoppage time as Queens were able to see out the final moments to secure a well earned point, that to be honest, did not look very likely 17 minutes into the contest. Sponsors gave Andy Dowie the man-of-the-match award, with the majority of the crowd of 1728 happy enough to see their side take a well earned point from the game. 14:25 Falkirk XI; Rogers, Leahy, Muirhead, McCracken, Vaulks, Alston, Baird, Sibbald, Kerr, Grant, McHugh. 14:26 Falkirk subs; Takarczyk (GK), Smith, Blair, Miller, Watson, Sinnamon, O`Hara. 14:31 Queens make four changes Dowie, Harris, Russell and Jacobs in for Kidd, Oliver,Heffernan and Conroy. 4 min Falkirk have started brightly here with a succession of corners but Grant can`t keep his header on target. 7 min Sibbald is fouled just outside Queens` penalty box and is lining up a shot. 7 min Sibbald`s effort his deflected over the bar for a corner. 8 min Another chance for Falkirk, this time McHugh`s header is superbly saved by Thomson. 10 min Muirhead has a shot from 20-yards out but blasts his strike over. 19 min Vaulks heads home to give the visitors the lead. 26 min Harris takes a shot from 18-yards out but is tipped over the bar by Rogers. First real chance for Queens so far. 29 min Queens starting to get back in to the match, Jacobs with the headed effort from six yards is punched away from Rogers. 34 min Penalty to QUEENS. 40 min Marshall fouls Alston just outside the box. 41 min Leahy free-kick doesn`t trouble Thomson. 49 min Russell`s shot from the right hand side is tipped wide by Rogers. 49 min Queens have started the second half brightly, Brownlie`s shot deflected out for a corner. 55 min Russell turns his marker and slices his shot from 25-yards just wide of the goal. Still 1-1. 59 min Vaulks booked for a rash challenge on Lyle. 62 min Baird has a shot but his effort is nowhere near the target. 64 min Harris runs with the ball for 30-yards but his shot is straight at the Falkirk goalkeeper. 73 min Muirhead cautioned for wrestling Marshall to the ground. 77 min Hutton booked for a challenge on Muirhead. 85 min What a couple of minutes here at Palmerston. Miller heads home at one end and Russell goes up the other end of the park and slots home. 88 min Today`s official attendance is 1728. 16:51 A very entertaining game at Palmerston which ends in a 2-2 draw. Goals from Derek Lyle and Iain Russell make sure Queens pick up a point.